Looters in Van Texas after Tornado – shoot ’em on site! There is nothing you can do to looters that is too much. In little Van, Texas which was devastated Sunday by tornadoes now has to deal with looters going through their ravaged homes stealing what is not destroyed. That is the lowest of the low. Nothing is too bad for these people. Rioters who loot, shoot them on site. 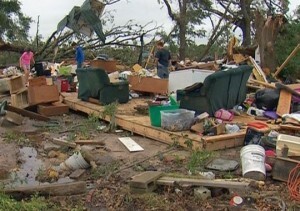 Loot homes of tornado victims, shoot them on site. Stealing from anyone is bad enough, but it is ratcheted up exponentially when you take advantage of the vulnerable – those who are disabled, disadvantaged or have suffered a catastrophic loss like this. See the details in the article below. “It’s hard to replace the things, but for somebody to go in and take it from me, that makes it twice as hard”. For some victims in this small community 70 miles east of Dallas, everything is gone. On Monday, neighbors and volunteers pitched in to help clean up the mess. Brian Grant is disabled and came home to find his residence was among those damaged. He and neighbors said looters had already ransacked their homes. “Evidently, I guess they come in through the window here and rifled through my things,” Grant said as he showed a broken window leading to his kitchen. Grant said thieves took prescription drugs, weapons, electronics and other valuables, and neighbors had similar stories.